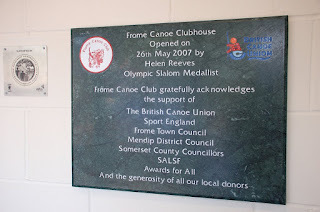 Opened in May 2007 by Helen Reeves, our clubhouse continues to provide top of the range facilities for canoeists and other community groups. The building was designed by local architects (NVB) and includes some very superior features like the under-floor heating in the changing rooms. All the other rooms open from this large space and it provides a place to meet, greet and sign in for club sessions. 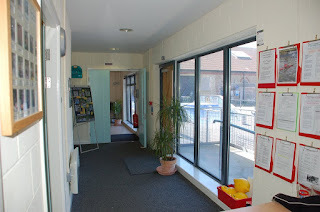 All the notices of club events are here, along with other information and so the entrance hall has become the place to find out what is going on in the club. This space is used for meetings, courses and small social events. There is comfortable seating for 12 around large tables, ideal for committee meetings. Data projection to a pull down screen is available. Alternatively the tables can be stacked, and up to 25 plastic chairs can be arranged for larger gatherings. This space is well used by us on club nights - parents and other club members not wishing to paddle. A small kitchen leads off at the back of the room. Hot drinks and simple meals can be prepared here. This large room provides a versatile space with clean modern lines and is ideal for public meetings and social events. It is accessed by stairs only and so there are limitations on its use for people with disabilities. Tables, and up to 50 soft chairs, can be arranged to suit the purpose of the event. Data projection to a pull down screen is also available. 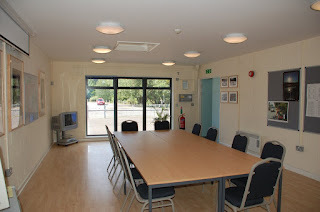 The meeting room is available to hire by other community groups at a charge of £12 per hour. The first floor room costs £20 per hour. Please contact Pam Dixon. These are warm spaces which are clean and bright. 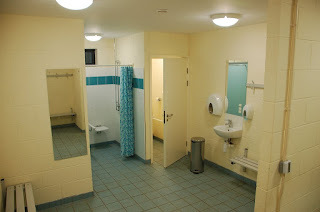 Male, female and disabled rooms have toilet and showers along with lockers for storage of valuables. The under-floor heating makes changing out of cold wet canoeing kit quite a pleasure!